"Mountain of Wealth" token, awarded by Elitre. 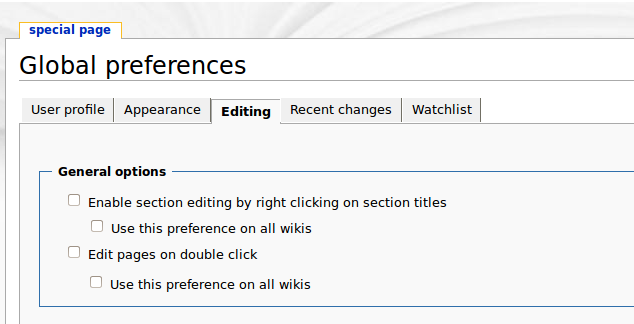 The checkboxes/text for the "Use this preference on all wikis", appear directly in line with the parent-preference that they're associated with. This makes it unclear, that they will only affect the item above. Resolved Samwilson T178267 Dynamically enable/disable the related pref when toggling "Set a local exception for this global preference"
Resolved Samwilson T178449 RFC: How to modify all preferences? bzimport set Reference to bz66869. (You mean a "circular-styled checkbox".) Yes, that'd be a reasonable addition, to further emphasize the different nature of these toggles. Or some sort of dotted line in an L-shape. I don't think adding the L shaped line is necessary. Taking Quiddity and Elitre's suggestion a little further I've made the size of the text smaller and increased the space between the two options to show the grouping. Don't do different shapes. If this is really the best way to implement it, just indent it (making it slightly smaller also probably wouldn't hurt, but it's less important). That makes the relationship clear without confusing the functionality with different kinds of inputs, in this case due to radial ones being circular. If this is really the best way to implement it, just indent it. I am sure there are better ways, this is just the one that I (we) could think of. That makes the relationship clear without confusing the functionality with different kinds of inputs, in this case due to radio ones being circular. Agreed, no point making a circular checkbox and causing confusion. Lets make the second one a checkbox too but keep the margins and sizes that are seen in attachment 15691 ? in attachment 15691 [details] ? Ok, did that in I2f70d8763be7081466b7a25b77537ff77ffa3fe9. I see your point. If people are going to come to this page to set Global preferences, then maybe there shouldn't be a separate checkbox to actually do so. Keeping the design the same we could make the label "Don't use this preference on all wikis", reducing one step. Would that make more sense? I would guess that we're assuming that most editors only want to change a "few" options globally. Therefore, they'd only check (opt-in) a few boxes at the GlobalPreferences page. 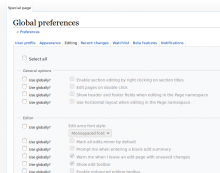 If instead, we were to assume that most editors will want to use GlobalPreferences as their primary preferences panel, then I guess we'd either start with all boxes checked (everything opted-in), or, turn the checkbox into an "opt-out" or "Don't set this preference globally" parameter. However, doing that would cause local-overrides for everyone, and make things more complicated for the (vast majority of) users who only edit at a single wiki, who'd then have to go to Meta to set their primary preferences. Hence, I think we want to leave it the way it is. I think you were going in the right direction before, with attachment 15691 (but with the square checkbox). 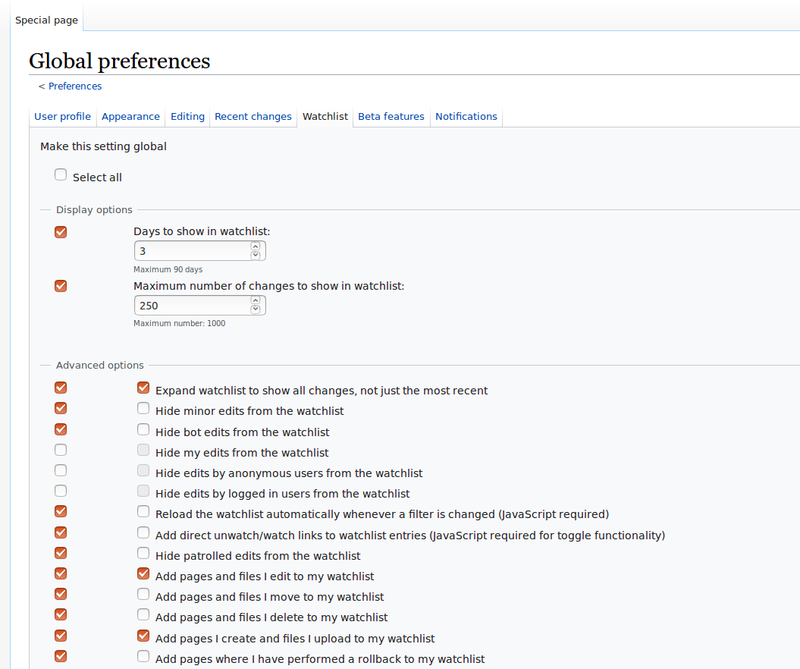 The GlobalPreferences form is available on all wikis on which its used, so there wouldn't be any need to go to Meta. If GlobalPreferences was to be the main preferences interface (and the other one maybe renamed 'LocalPreferences' or something?) then perhaps the 'Preferences' link in the user menu could go straight to it. But that's a bit off topic, what I wanted to say that perhaps it'd be good to disable the associated preference until the opt-in checkbox is ticked? That might help make it clearer that the option has to be "turned on for all wikis". And it could even go above the option as well, or near the label. I had a crack at making the global preferences slightly more obvious when they're disabled, and on hover when they're being enabled. It might be better to highlight the whole relevant table rows on hover, rather than just the labels. Samwilson moved this task from Ready to In Development on the Community-Tech-Sprint board. That looks great, Sam! Just what I was imagining. I hesitantly suggest that it is sufficient, and no further work on this aspect is needed. (Just because there are more complex and important features/bugs to work on). How's this as an alternate idea? Put all the "make this global" radio buttons down the left side, so you always know where they are. There's a None/All dropbox at the top of that column if you want to switch all of them to global at once. Here's one that shows the global radio buttons next to more radio buttons, for extra radio button action. I agree with Isarra that it's a bit confusing using radio buttons as checkboxes (i.e. for a cumulative selector rather than an exclusive selector). Yes, surely these have to be checkboxes? And the idea of lining them up at the side is great! I like it. There are other parts of the form that need to be removed too, I think (such as email address and gadgets, which can't be global). And parts (like timezone offset) that are currently not global-selectable. @Quiddity: do you mean about local-overrides? I think we need more tickets about the other parts that need to be done for GlobalPreferences! But it does sound like the UX is a big issue about how it's all going to be structured and work (although, that's more than just this ticket, certainly). Yeah, you're right -- checkboxes, rather than radio buttons. I think that's a good idea, but please at some kind of line between the columnds to make the ui more clear. I've got most of the new form layout working, and am sorting out the section header bit (the toggle all drop-down). How does one add a section header to every section? Can anyone tell me how to tell SpecialPreferences class that I want to use a custom PreferencesForm class for the form? At the moment I'd have to override SpecialPreferences::execute() and only change one line of code in it. The better option I see is to alter that class in core to allow subclasses to provide their own forms; is that worth doing? @Elitre: good point. But where? I've gone ahead and created a patch for core anyway, to show what the idea is. I'll go ahead and get the all-checkbox toggle dropdown done. 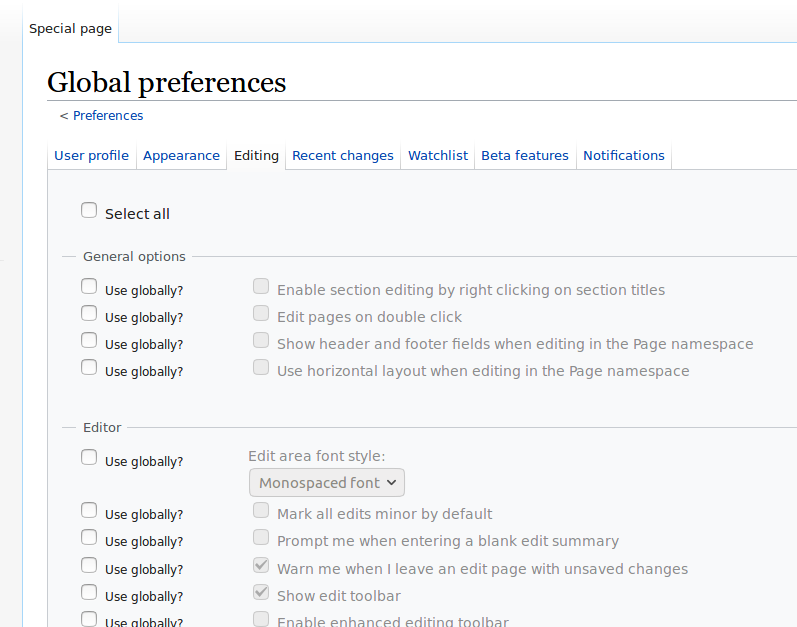 How important is it that the GlobalPreferences checkboxes for BetaFeatures are OOUI? The BetaFeatures preferences are OOUI, but they are the only ones (at least, I can't find any other extensions doing something similar), and I'm just wondering if it's worth the hassle of handling these in a whole separate way to the rest of the global preferences form. The select-all checkbox at the top has to be modified as well, just for this one form tab. There's T117781: Convert Special:Preferences to OOUI that will happen at some point, and when it does we'll have to update GlobalPreferences. I'm not (only) being lazy: I'd like to get the minimal version of this issue completed before working on making it also work more smoothly for non-core preferences. I've got a bit of the OOUI-for-BetaFeatures working, but it's proving to complicate things and I suspect (especially with local overrides coming soon) that things will just have to be refactored anyway. After discussion, we've decided to leave the OOUI-compatibility stuff for a separate issue. @DannyH: What do you think? See movie above. Hi, sorry I missed this. I don't think the global preferences page should look totally grayed out. It looks like the only thing that's live is the "select all" checkbox. People should be able to tell which preferences are global and which aren't, but I don't think graying is the way to go. In the demo at 0:08, when you switch on Select all on the Recent changes tab, the "Group changes by page in recent changes and watchlist" has two orange checkboxes in a row -- the "make this global" checkbox, and the actual "group changes" preference checkbox. On current preferences, the actual preference checkboxes are smaller, and white-on-blue. I like the idea of using the orange checkboxes for the "make this global" boxes, which will help people visually separate which ones are global and which aren't. What do you think? The appearance of the orange (or white-on-blue) checkboxes are down to different browsers and operating systems, unfortunately (e.g.). They're all just native checkboxes and so there's not all that much we can do with them. Perhaps we get rid of the greyed-out-edness and instead have a background color to draw attention to the ones that are globalized? And/or we have a label next to the globalization checkbox. At the moment there is one but it's hidden; it reads Use this preference on all wikis but that's a bit long for the space. Perhaps just Make global?? Use Globally? sounds better imo. Re: checkbox color. All of these will soon be OOUI style anyway. @Quiddity that's true. Although, then they'll still all look the same. Or are we allowed to change their colour (I guess doing so is possible with OOUI)? I'd have thought not. Re: changing OOUI color for just the "global" row of checkboxes, I don't know if that is possible, or how strongly it might be discouraged. @Volker_E ? Re: having the string "Use global?" (or similar) after each checkbox: The main potential problem is translated-string lengths - e.g. that string might need to be longer than we expect in some languages. The "make this setting global" text is on the wireframes... it should be at the top, above select all/none. That's too bad about the colors. I think we can just use the checkbox to say whether it's actually set as a global preference of not. Oh, and I really like the use of the background color to show what the checkbox is related to. That works great. From a UX perspective it's not convincing that coloring the checkbox backgrounds would provide a useful improvement. Altering a well-learnt user interface widget to signalize section affiliation might result in confused users too. Also, we would then probably move away from our Web Content Accessibility Guidelines conforming, high color-contrast default widget appearance to one, that could be a problem for users with visual impairments again. And last, but not least, color shouldn't be the only way to convey information. I'd rather emphasize the affiliation with gestalt principle of proximity or connectivity in different terms. Coming late to this task, there's still need for me to clarify what the current issues with the interface are, which we need to overcome. And you can try it out on the Community Tech wiki at https://commtech.wmflabs.org/wiki/Special:GlobalPreferences (you'll need to register an account). I think it would be great to invite the folks who've been commenting on the project page to check this out, and see what they think. @Samwilson would that work for you? @DannyH yes, great idea! People can register on commtech wiki (they just need to know that our IRC channel is #wikimedia-commtech, as that's the dreadfully secret spam-preventer word). @DannyH: Any update on this? Samwilson closed this task as Resolved. Checkboxes are now at the side in a column, and there's a select-all at the top. Further improvements to the UI already have tickets, so this I think can be closed. Huzza!